If you are looking for an easy Super Bowl sandwich recipe to please the football fans in your life, definitely take a second and keep reading! This recipe sort of came about as a fluke. I originally planned to make mini pulled pork sandwiches, but I sent the fiancé to the store and he came back with a sixteen dollar beef roast. I was a little irritated at first, but figured it was not worth the effort or time to return a hunk of meat to Kroger and figured I could make it work. Being that I wanted to slow cook dinner, I simply changed up my plan and decided to go with BBQ beef sandwiches instead of pulled pork. The flavor of this BBQ beef is quite delectable and the sauce tastes very similar to Arby’s Sauce, which I love in large doses! This recipe could not be easier and it just might steal the spotlight at your Super Bowl party. Toss it into the crock pot Sunday morning, and you’ll have the men drooling by game time. I served these up slider style on mini buns with a dollop of homemade cole slaw and alongside potato chips. This made for a very hearty dinner and great leftovers. If you are looking to add something to your Super Bowl Spread, give these a try. Remember to stop back over to let me know how you liked them…I love hearing from my fabulous readers! Just a note: When I switched to WordPress, I seem to have lost quite a few readers, so if you still like me and want to re-subscribe, you can do so by clicking here. Place the roast into a slow cooker along with the water. Cover, and cook on LOW for 4 hours, or until beef can be easily shredded with a fork. Shred the beef, removing fat as you go. Remove 1/2 cup of the broth from the slow cooker, and reserve for later.In a medium bowl, mix the vinegar, brown sugar, dry mustard, Worcestershire sauce, ketchup, honey, salt, pepper, cayenne, crushed red pepper and garlic. Cover, and continue to cook beef on LOW for an additional 4 to 6 hours. Add the reserved broth only if necessary to maintain moisture. These are adorable! I bet they taste awesome paired with the sweet Hawaiian rolls. 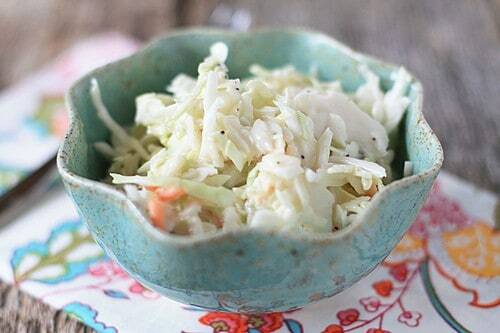 I love how you added poppy seeds to your coleslaw. What a great idea! These mini BBQ beef sandwiches look like they would be the perfect guest at a party. They look awesome. The sweet slaw is a nice touch. Isn’t it a drag switching your blog over?Takes some time for everyone to find you again. Sometimes the best dishes come from a shopping trip gone wrong. This is absolutely perfect for the Super Bowl! My mistake worked out great, wrong meat= delicious dinner!! These look great! And I just got those exact bowls (and the matching plates) in the mail yesterday. Love them, they are soooo gorgeous! This happens to me all. the. time. My husband goes to the store for lettuce and comes back with cabbage (or worse!). Looks like an excellent mistake, though – these look great! 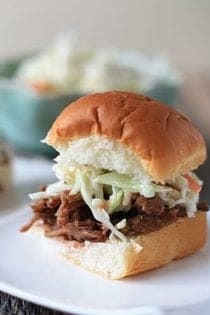 I love bbq sandwiches with cole slaw on top!! You had me at ‘sliders.’ Yum. Love sliders in all forms. Your pictures are fantastic! I don’t do meat, but I appreciate your fabulous photos. I am SO glad you are going to Blogher! Can’t wait to meet you! I featured this for my Superbowl Sunday… It looks fabulous! I made these for our Superbowl party and they were absolutely DELISH! The slaw was yummy too. Thanks for the recipe. I think it’s going to become a regular for our parties because it’s sooooooooo easy. You can rub the meat and slow cook it on the grill too if you are looking to add even more flavor. Also, adding some hickory or apple can help add even more. Do you think this recipe would work with a bottle of “Honey Garlic BBQ Sauce” (I know it’s cheating). If so, what would you do differently?? Just cook as in and use the BBQ sauce as a topping once it is cooked. I have done this on many occasions. Enjoy! My husband and I loved your recipe! We topped it with some leftover homemade blue cheese dressing, and that made this dish even more phenomenal! Thanks for a meal that we will have many times to come!! That is fantastic to hear! I am so happy you loved it, and your addition of blue cheese dressing sounds superb! I made this for my stepmom’s birthday and it came out so awesome. It was delicious. I didn’t have cayenne pepper so I used chili powder but I loved it and so did she. IT was so tender and yummy. I had a question about this one. First off, I made it tonight and it was delicious. My 3 year old, who had never had coleslaw before, gobbled it down. But I’m afraid that I did it incorrectly. Do you drain all the juice out of the slow cooker before adding the sauce…or JUST that 1/2 cup? Jamie – my family is from the south and we have always put cole slaw on our pulled pork, which tends to be more vinegar-y than tomato-y, and chili dogs, much to the dismay of any one who was dining with us. 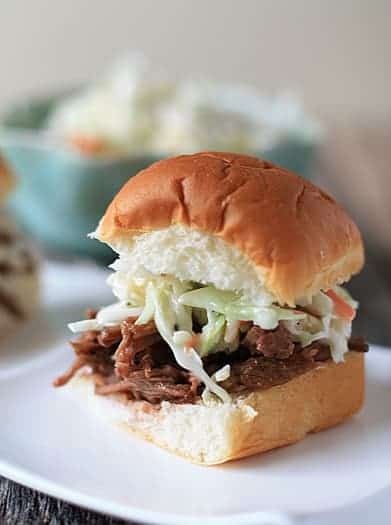 We have created lots of converts, who now don’t think twice about “getting their slaw on,” but I loved seeing you posting a recipe with the slaw in the sandwich – because it’s so good! People don’t realize what a favor you are doing for them, until they take a bite! My family has a Kentucky Derby party and for the last one we celebrated the “frontside” of the race, with all the big hats, mint juleps, and bourbon balls you’d expect. We had a full, Southern buffet – the utmost in civility and Southern charm ;) . This year we are celebrating the “backside” of the race – where the trainers and owners and everyone behind the magic of the day celebrates, and I am planning that bourbon punch will have a spot again on the menu, but so will pulled pork sliders with cole slaw! I just found your site also, and I was wandering if you could use this recipe for the pork as well. Thanks can’t wait to hear back from you. I have never tried this particular recipe with pork, but I am sure it will be delicious as well. Stop back and let us know how it works out! do u happen to know how many people this feeds? Or how many buns to buy? I would say 8-10 large servings. I hope this helps. Have a great day.